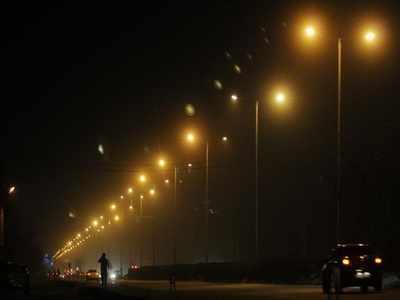 NOIDA: The Noida Authority has decided to replace around 74,000 streetlamps in the city with LEDs by next year, a move that is expected to reduce power consumption by more than 50%. In the first phase, the Authority has already replaced 400 of the 3,800 lights along the 25km Noida-Greater Noida Expressway. “The existing streetlights, which are serviced by high-voltage sodium lamps, will be replaced with LED lights over the next year. Besides, the existing feeder panels will make way for a new centralised monitoring system. The existing earthing system will be rectified as well,” said RP Singh, the project engineer of the Noida Authority. The centralised monitoring system will automatically control power consumption and keep a record of the usage. According to Singh, the cost for the replacements of lights will be augmented by the savings in the electricity bill. The lights are being replaced by Tata Projects Ltd, which will maintain the LEDs for seven years and bear all the expenditure. The project is expected to bring down power consumption by 56% for the Authority, which will pay the private company the entire savings on the electricity bill after deducting 11%. Singh said the project had already been implemented in Bhubaneswar and Pune. According to officials, the Noida Authority pays a power bill of Rs 72 crore annually, an amount that will translate to Rs 504 crore in seven years if the traditional streetlamps are not replaced. “Tata Projects Ltd has said they would replace the existing lights with LEDs and their technology will help us save 56% in power consumption,” the official said. According to Singh, the Authority hopes to save nearly Rs 112 crore over the next seven years by replacing the lights. “These savings will be utilised for beatifying streets and putting in place road safety measures,” he added. Work on replacing the lights along the expressway is part of the first phase of the project and is expected to be over by August 10. Work in the sectors, parks, streets, and others major roads will start thereafter. The Authority is also taking the help of IIT Roorkee in the project. NOIDA: Smelling another scam, YEIDA has ordered inquiry into the land purchased in a village in Hathras district in 2013. Authority officials said this purchase too was made using a modus operandi similar to that used in the Rs 126 scam. The inquiry was ordered after YEIDA chairman and Meerut division commissioner Prabhat Kumar received a complaint from a Noida resident about Ramesh Bansal. YEIDA CEO Arunvir Singh told TOI Kumar has asked for an inquiry and named GM (planning) Meena Bhargava as investigating officer. He said the extent of land purchased and amount of taxpayer’s money involved in the purchase, can only be revealed after the inquiry. A written order has been passed by the CEO to this affect on Tuesday. An official said the land was purchased in Mudawli village at rates higher than what were prevalent. 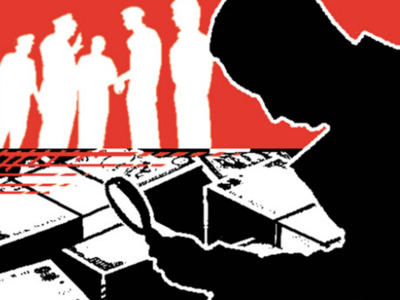 “The modus operandi was similar to the Rs 126 scam. Here too, there’s no layout of the land purchased. It’s not part of the Master Plan. It too was officially bought as abadi land for farmers whose land was acquired for the Yamuna Expressway,” he added. “There’s no reason why abadi land should be offered to farmers of Agra and Mathura in a village in Hathras,” sources said. NOIDA: It was a yoga session with a message to the government. 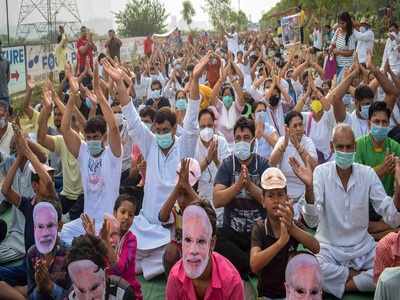 Hundreds of residents including women and children around Sector 123 landfill site took to kooda yoga  a term coined by them while they did various yoga asanas calling them kachra (garbage) aasan, badbu (foul smell) aasan, sadan (stink) aasan etc. wearing different masks, including that of PM Modi. The residents also took out a protest march near the FNG roundabout later. While the Gautam Budh Nagar district celebrated the fourth International Day of Yoga with the underlying message of healthy living, hundreds of residents including women and children surrounding Sector 123 landfill site took to 'kooda yoga' amid stinking garbage dumped at Sector 123 site. We wore masks near the landfill site with a message that while Prime Minister Narendra Modi talks about Swasth (health) and Swacch (clean) Bharat, we are forced to live in unhygienic conditions due to illegal dumping of garbage by Noida Authority at Sector 123 site within the vicinity of our homes, said Sukhveer Pahalwan, president, Kooda Ghar Sangharsh Samiti (KGSS). On the occasion, Pahalwan also announced that if the landfill site in Sector 123 is not relocated by July 1, he would sit for fast-unto-death at the protest site. While hundreds gathered from neighbouring villages like Parthala, Sorkha, Behlolpur and Garhi Chaukhandi as well from highrise apartments near the site early from 7am, there was also unbearable smell due to past few days of dumping of garbage at the landfill site. Meanwhile, a bigger protest is planned for Sunday. 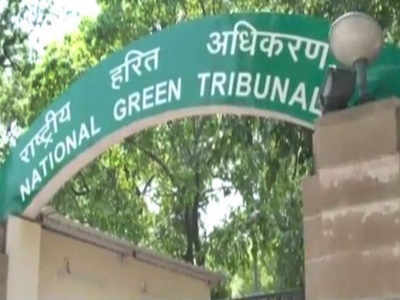 NOIDA: Nefowa, the association of flat owners in Noida Extension, on Thursday filed two applications at the National Green Tribunal—one seeking impleadment on behalf of residents of Noida affected by the shifting of the landfill site to Sector 123, and another application requesting reconsideration of the order dated May 29 of NGT (which stopped dumping of garbage in Sector 54 after which Sector 123 was designated by the authority). It seeks a direction to the Noida Authority to dump the garbage at the site in Astoli village in Greater Noida instead of Sector 123. “Today we filed two applications before the NGT on the case filed by resident welfare associations of sectors 22, 23, 53, 55 and 56 (OA No. 342/2018) against the dumping of garbage in Sector 54. The first application has sought an impleadment in the matter on behalf of the residents of Noida who are getting hugely affected by the shifting of the dump site from Sector 54 to Sector 123. And in the second application, we requested reconsideration of the order dated May 29, 2018 and sought a direction to the authority to dump the garbage at the dumping site in Astoli village, Greater Noida instead of Sector 123,” said Abhishek Kumar president, Nefowa. In its application, Nefowa has urged that since Noida has already taken environmental clearance for the municipal solid waste (MSW) management and processing facility at Astoli way back on May 13, 2016 there is no justification in creating a temporary dumping site in Sector 123 in violation of the provisions of the solid waste management (SWM) rules 2016. Further, since the Sector 123 landfill site is next to densely populated residential areas, Nefowa pleaded that it is clearly in violation of the applicable rules and is adversely going to affect the health of the residents and their future welfare. “We have therefore requested NGT that the Noida Authority must stop playing with the lives of the residents and move the Sector 123 site to Astoli as per their original plan,” said Indrish Gupta, founder, Nefowa. NOIDA: The Noida Authority has replaced traditional streetlights along the Noida-Greater Noida Expressway with LEDs, but traffic signals in the city portray a difference picture. Traffic lights at various junctions in Jhundpura, Sector 6 police chowki, Sector 27 main signal, Sector 19-27 crossing, Adobe intersection, Sector 57 intersection, 12/22/56 T-point, etc have not been working. Many of the lights have been defunct for months. None of the signals at Adobe intersection, near Sandeep Paper Mills, the main Sector 27 crossing ahead of the DM office intersection, etc were found to be functioning. Travellers could be seen driving rashly, violating traffic rules at will. Residents pointed out that many of these signals were not functioning either because their batteries needed to be recharged or their cables were cut. Manish Kumar, who regularly travels from Greater Noida (west) to NSEZ, told TOI that the two signals at the NSEZ T-point and Haldoni Morh had not been operating for the past three months. “Since the strength of traffic police has increased, one can spot marshals managing traffic at these points. But with the signals not working, their job becomes tough. The signals that are functional can make things easier for the marshals too,” he said. The traffic police said they had written multiple letters to the Authority to get these lights repaired, but only some of them have become functional over the past few days. Traffic inspector Layak Singh said lights at the signal becoming defunct was a perennial issue. The system is likely to be in place by 2019, a good nine months away. KGSS took out a drum beat procession near FNG roundabout. 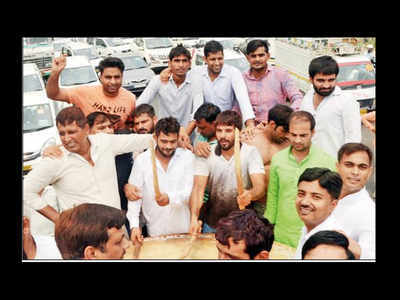 NOIDA: The Noida Authority had stopped dumping of garbage at the proposed site for a waste-to-energy plant in Sector 123 from Thursday evening even as nearby residents said they would not change their protest plans. Besides, there is no police presence at the site since Thursday. Additional CEO R K Mishra said the Authority is “exploring alternative sites for temporary storage and management of solid waste.” Since the exact nature of this shift is not yet clear—whether it will be permanent or temporary—residents from highrise buildings as well as neighbouring villages remained cautious and insisted that the Authority submit a written affidavit to the NGT stating that the Sector 123 site would not be used for any waste segregation or waste-to-energy plant, and change the ‘land use’ of the site in Master Plan 2031 to an educational or sports project. “We have appealed to chief minister Yogi Adityanath and MLA Pankaj Singh to have the dumped garbage removed from Sector 123 site. We also want to change the ‘land use’ of Sector 123 in Master Plan 2031 to a sports or a degree college,” said a resident from Sector 122 who did not wish to be named. The move comes after chief minister Yogi Adityanath expressed displeasure on the matter and directed the shifting of garbage site from Sector 123 on Thursday. According to sources, the authority has been instructed to look for alternative places. Meanwhile, local residents called for reclaiming the 25-acre land around Sector 123 near the Hindon river following Friday’s developments. “We apprecite the chief minister as he listened to people’s voice and hope that our concerns for future redress are heard likewise,” said Anjali Singh, a resident of Sector 120. Noida: LED lights, which have replaced traditional streetlamps along the Noida-Greater Noida Expressway, were inaugurated on Friday evening. 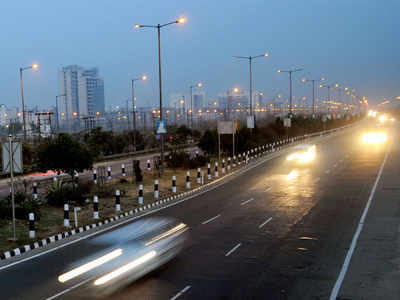 Noida Authority CEO Alok Tandon, who inaugurated the smart streetlights LEDsystem, said the expression of interest for the project was released last year in July and Tata Projects Ltd had bagged the tender two months ago for replacing streetlamps in the city with LEDs and maintaining them for seven years. “The private company started replacing the lights with LEDs from June 1. They have so far replaced around 500 light points along the expressway. We hope to replace 74,000 lights in the city in one year,” Tandon said. Officials in the private agency said it would target replacing around 20,000 streetlights every four months. The project is expected to bring down power consumption by 56% for the Authority, which will pay Tata the entire savings on the electricity bill after deducting 11%. According to officials, the Noida Authority pays a power bill of Rs 72 crore annually, an amount that will translate to Rs 504 crore in seven years if the traditional streetlamps are not replaced. Tanmay Chaturvedi, an official of Tata Projects Ltd, said the initiative would provide a streamlined power supply to Noida. “Some municipal corporation had previously shifted to LED lights, but many of them were non- functional. We will ensure all the lights are replaced with LEDs and they are properly maintained for the next seven years. Evenings in Noida will now be bright and safe,” he said. Happy anniversary: RWA too joins to make it memorable Meenakshi Sinha| TNN | Jun 23, 2018, 02:44 IST The Sangals were given an anniversary card and a sapling. NOIDA: Their 58th anniversarywas special — not only because of the almost six decades of togetherness, but also for the fact that the entire housing society where Mr and Mrs Sangal lived had come forward to celebrate the occasion. The RWA of B-3 Aravalli apartment in Noida Sector 34 has decided to felicitate couples living in the housing society on their marriage anniversaries, a move aimed at warming up to the residents and inculcating a friendly environment. 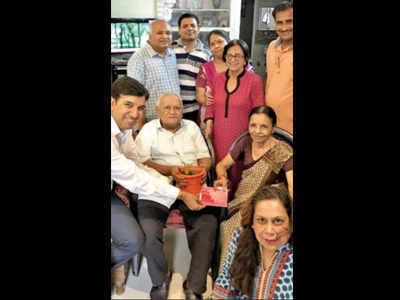 The initiative began on Friday, when the residents felicitated the senior-most couple of the society — V P Sangal and Pramila Sangal — on their 58th wedding anniversary. “We have begun a new initiative to felicitate couples on their marriage anniversaries. The idea is to celebrate some moments of happiness at a time families are getting nuclear and disintegrated due to work pressure or any other reason. The other objective is to create a good family environment in the sector and the society, and in turn, ensure an emotional connect with the residents here,” said DharmendraSharma, RWA president of the apartment. On their 58th anniversary on Friday, the Sangals were given an anniversary card and a sapling to promote environmental awareness in the society. “We feel very happy. We appreciate this gesture by the RWA,” said V P Sangal. Pradeep Singh, the RWA general secretary, said that while marriage was a memorable moment, “it’s also seen that over the years, those happy memories lose sheen”. “We aim to bring those memories back by celebrating together as a family. In the process, we intend to connect with the residents of the sector,” said Singh. Sanitation workers have not been collecting garbage at the city. NOIDA: The Noida Authority is now exploring other options to set up a plant a day after it stopped work on the waste-to-energy plant in Sector 123 on Friday. Local residents continued their protest near the dumping site in the area and demanded a written assurance that it will not be used as a dumping ground. The residents also organised a ‘havan’ for the ‘intellectual purification’ of the Authority officials near the protest site next to Homes in Sector 121. Sanitation workers have now stopped collecting garbage from ‘kooda-ghar’, or garbage collection points, outside sectors and societies and garbage has started to pile up. Sukhveer Pahalwan, a resident of Sarfabad village, said the protest will not be be called off untill the Noida Authority meets the demand of shifting the waste plant. “Noida Authority officials said this site was notified as a solid landfill site in the Master Plan 2021. This site is located near densely populated areas and is hazardous for residents. We demand that the Noida Authority make necessary corrections in the Master Plan and remove the plant from this site,” Pahalwan said. The residents are also in a dilemma as even though they have received information about project being put on hold from media sources, the Noida Authority has not confirmed this with them. Omveer Yadav, a leader of a farmers’ group, said the Authority officials should inform residents about the development. “The local residents are still unsure about the official stand of Authority over the issue. Chief minister Yogi Adityanath has asked them to shift the dumping ground to another location. The officials should take this seriously and follow the CM’s directive,” he said. Most police personnel were withdrawn from the waste plant on Friday and Saturday after Noida decided to explore alternative sites for storage and management of garbage. Work remained suspended on Saturday at the site. A JCB machine was parked so as to block the entrance. According to sources, so far around Rs 2 crore was spent on digging the trench to store garbage at the Sector 123 site. The Noida Authority is now exploring the Sector 151-A site and one in Astoli village for solid waste management. NOIDA: The second U-turn on the Noida-Delhi link road was inaugurated on Sunday evening, but most commuters preferred using the two cuts on the road. The U-turn was inaugurated by Union minister Mahesh Sharma in the presence of some BJP members and a few Noida Authority officials. The inaugural took place around 5.30pm and the minister's car was the first to use it. However, not many people were seen using the U-turn on the first day as the two cuts in front of Sector 15 A are yet to be sealed. An official said the cuts would be closed soon. TOI had reported earlier that the U-turn could pose multiple challenges to traffic both during peak hours and on Sundays as vehicles willing to use it have to slow down to turn towards the left. On Sunday, some vehicles could be seen speeding away nonchalantly without caring about the U-turn. "This is an example of wrong engineering. Everybody knows about it," a contractor present near the U-turn said. Noida revises parking rates, cars line up roads Shikha Salaria| TNN | Jun 25, 2018, 02:23 IST Under the revised rate policy, those parking their vehicles at designated places will have to pay Rs 20 for the first two hours. NOIDA: Parking lots managed by private agencies under the Noida Authority’s revised policy have no marked demarcation for categories of vehicles and are charging relatively higher rates, travellers have complained. Attendants at some parking lots have also not been issuing printed receipts, some of the users alleged. The attendants said the revised rates fixed by the Authority had been forcing people to park their vehicles along the city’s roads rather than using the parking lots. This has not only led to snarls at intersections, but also brought down business for the agencies managing the parking lots. Under the revised rate policy, those parking their vehicles at designated places will have to pay Rs 20 for the first two hours and Rs 10 for every subsequent hour. The Authority has divided parking lots in the city into six clusters. As of now, the new policy has been implemented in 35 areas under the first cluster. At most of these places, attendants have been issuing manual slips. Akash Singh, a Noida-based engineer, said the rates were not justified. “Earlier, we used to pay only Rs 20 for parking our vehicles through the day. But now, it will come to around Rs 80 as the rate will increase with each hour,” he said. At the underground parking near Sab Mall, attendants said 50% of the commuters had stopped using it because of the revised rates and were instead parking their cars along the roads. “Just take a round of Sector 27 and you will find that most of the roads are lined with vehicles. The parking once used to be full with 80 vehicles, but there are only 40-50 now,” an attendant said. 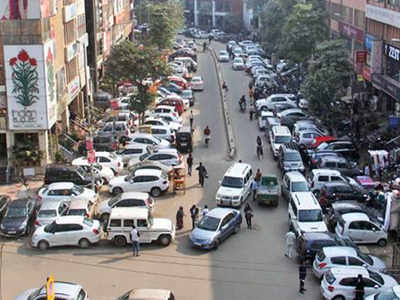 He said although parking rates had gone up, daily earning continued to range between Rs 1,400 and Rs 1,500 due to the lesser number of people using the car parking. Sandeep Chandra, chief project engineer at the Authority, said the contractors had been asked to ensure complete demarcation at the parking lots, hand-held machines, ID cards and uniforms for attendants, installation of information boards, etc. “Meetings will be held to streamline parking lots soon,” he said. The new dumping site is near Tilapta container depot, nearly one kilometre from Khodna-Khurd village. 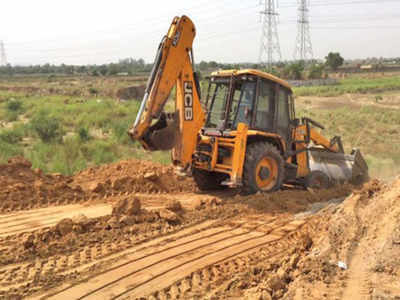 NOIDA: Two days after it stopped the work for a waste plant in Sector 123 due to protests, the Noida Authority on Sunday started digging a trench in an eight-hectre land in Khodna-Khurd village in Greater Noida to temporarily store garbage. In the morning, a few officials reached the village with two earthmovers and started making ramps on the spot. On receiving information, local residents reached the spot and opposed the work. They also climbed on the earthmovers and halted the work briefly. A team from Surajpur police station also reached the spot and dispersed the gathering. The work later resumed after heavy deployment of police personnel. The new dumping site is near Tilapta container depot, nearly one kilometre from Khodna-Khurd village and two kilometres from Devta village. The dumping site is nearly 15 kilometres from Noida Extension and 13 kilometres from Pari Chowk in Greater Noida. Khodna-Khurd village is home to nearly 500 families while a similar number of people live in the neighbouring Devta village. Rajendra Singh, a resident of Khodna-Khurd village, said the Greater Noida Authority had acquired the land in 2009. We had no idea about the land use. Two days ago, a few officials came for spot inspection. On Sunday morning, they reached the spot with two earthmovers and started the work, he said. He said the local residents do not want a dumping ground on the spot as it will adversely affect their health and environment. Bhanwar Singh, another resident, wondered why Noidas garbage should be dumped in Greater Noida area. Though the Authority has put the waste plant work in Sector 123 on hold, it has not abandoned the project. According to the Noida Master Plan 2021 and 2031, Sector 123 and Sector 151-A have been notified as Solid Landfill Sites. There is no change in the master plan so far, said a senior Authority official. 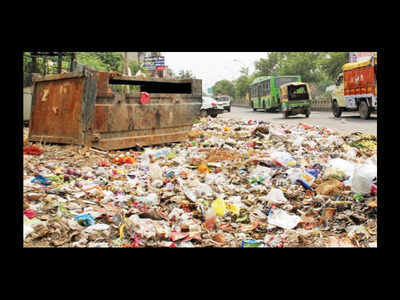 Rajesh Kumar Singh, OSD, Noida Authority, said the garbage would be stored in Khodna-Khurd site for two months. We are taking all steps to scientifically store the garbage at this spot. This site is away from residential areas, he said. Meanwhile, a site in Astoli village, nearly 40 kilometres from Sector 123 and 24 kilometre from Sector 151-A, also remains an option to create a dump yard. However, if remote sites are selected for waste disposal, Noida residents would be taxed for garbage transportation, said a senior official. The transportation cost would be immense if Astoli is selected for garbage disposal as the trucks would have to cover nearly 100 km for a round trip. The site in Sector 151-A has been acquired by the Noida Authority but there is no construction there as of now. Also, it is near upcoming projects like Jaypee Aman Sector 151 and ATS Kinghood Drive in Sector 152. It is also adjacent to Kam Nagar and Gurja Dairy village along the Noida expressway. Noida: Local residents will be consulted before identifying any new site for a waste plant and a committee comprising all stakeholders will also be formed for the purpose, district magistrate B N Singh said on Sunday. The move comes after the Noida Authority wrote a letter to the district magistrate requesting for identification of a site for waste-to-energy plant as the development was stalled in Sector 123 due to protest. CEO, Noida Authority, Alok Tandon’s letter to DM states that Sector 123 and Sector 151-A have been notified as Sanitary Landfill Sites as per the Master Plans. “The Authority had been storing garbage in Sector 123 for five days in accordance with the National Green Tribunal’s May 29 order. However, the Authority is looking for an alternative site for this purpose due to the law and order situation,” it said. Reacting to the letter, the DM said that a committee comprising all stake holders—Noida Authority, district administration, local residents, etc—would be formed to hold consultations and arrive at a mutual understanding for selecting a waste management site. Noida waste-to-energy plant on hold: ‘Committee to look for another site, model villages to come up’ On May 29, an NGT bench had issued an order on a petition filed by a section of residents of sectors 22, 33, 53, 55 and 56 of Noida. The decision was taken by the standing committee last week. Two days after garbage disposal stopped at the site in Sector 123, where a waste-to-energy plant was being constructed, a committee is being formed to look for alternate sites, Noida Authority officials said, adding that villages surrounding the new site will be adopted and developed into model villages. “It is an issue of the city and the city itself will have to find a solution,” said Gautam Buddha Nagar district magistrate BN Singh. “A committee of all stakeholders comprising RWAs, village committees, politicians, media persons among others will be formed. The committee will take feedback from people about the alternate site. Noida Authority will be asked to make presentations for residents of the area where the next site is proposed,” Singh said. The DM added that “a package” will be provided to residents which will comprise health, education and employment benefits and will ensure that all environment and health concerns regarding a WTE project among locals are resolved. “Even if there is a perception of loss among residents of the area where the project is proposed, they will need to be addressed. I will request the IMA to provide free medical services in the area. As far as employment is concerned, I will also request the industries from Noida to voluntarily give preferential treatment to youth of this area on a merit basis. All possible government schemes should be saturated in the villages around the WTE site and the education department will be asked to ensure adequate facilities,” Singh added. The move came hours after a letter was sent to the DM from Noida Authority. Meanwhile, earlier this month, a protest by local residents had turned violent after stones were pelted at police teams near the site. Protesters had raised health and environment concerns over the setting up of a WTE plant near their residential colonies. The incident had led to the arrest of 80 residents on June 4. Despite the slew of arrests which took place, residents had refused to bow down to the administration and the NGT order. Recently, the International Yoga Day observed “kooda yoga” in order to attract government’s attention. On May 29, an NGT bench had issued an order on a petition filed by a section of residents of sectors 22, 33, 53, 55 and 56 of Noida. NOIDA: Resident welfare associations (RWAs) will install compost machines within sectors which will be maintained and operated from community centre earnings. Also, private contractors hired by authority for sanitation and horticulture work (related to watering of parks and pruning of trees etc.) will be hired once they are verified by the sector RWAs and sanitation work within residential sectors to be undertaken by RWAs once authority sanctions 75 % of its cost. All this and more were decided in a meeting of RWA federation with authority CEO Alok Tandon on Monday. “We met CEO Alok Tandon today to discuss the long pending unattended sanitation work in residential sectors due to the ongoing strike by sanitation workers, the segregation of waste charges proposed to be implemented from July 1 and modalities of implementation of compost machine in residential sectors etc.,” said N P Singh president Federation of Noida Residents Welfare Associations (FONRWA). Singh told TOI that the RWA federation demanded that Authority hand over sanitation work of residential sectors to sector RWAs by bearing 75 % of its cost. He also maintained that compost machines will be installed in sectors (starting with 10) where 95 % of the cost will be borne by authority and 5 % of its cost and operational expenses will be borne by RWAs through the earning of the sector community centres. “So the machines will be set up in sectors which have community centres where its power bill as well as operational cost up to 5 % will be borne through the earnings of the community centre. To begin with, 10 sectors will install these machines. We will send the list of those sectors in a couple of days. For sectors which do not have community centres, we have asked CEO Tandon that Authority should pay the power bill as well as the maintenance cost of compost machines to be set up there,” said Singh who added that CEO Tandon as agreed to the suggestion. “Community centre earnings can be used to maintain compost machines,” Tandon told TOI. Also, on RWA federation’s demand to hand over sanitation work of residential sectors to sector RWAs CEO Tandon told TOI that, “FONRWA mentioned that if they are allowed to handle sanitation works, they would be able to do the job at 75 % of the cost of what authority spends. We would try out this model in 5 RWAs,” said Tandon. “We will begin with five sectors such as 35, 52, 20, 100 etc. who are willing to take over the task once authority bears 75 % of its cost,” said A N Dhawan, secretary general FONRWA. While RWA federation refused to pay charges for door-to-door segregated municipal waste collection as understood by authority’s directive from July 1 (when it’ll stop collecting unsegregated waste) and demanded details of user charge, CEO Tandon maintained that segregation charge will not be issued anytime soon. 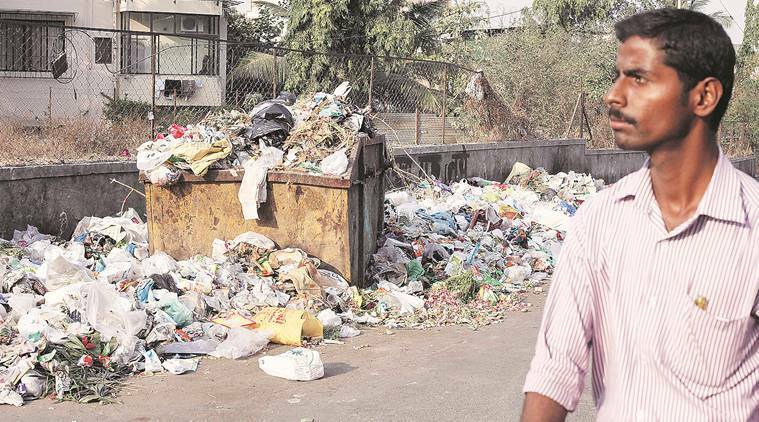 “The said charges will only come in force once a private agency is hired for door-to-door segregated waste collection,” said Tandon who agreed to provide details of user charge to be levied. FONRWA maintained that the residents have paid their municipal taxes/GST and Authority should provide civic facilities to the city rather than let it out to private contractors. “If short of funds then it should seek financial aid from state or central government rather than burden the residents of the city,” said Singh.